We had arrived at the security gate at Salta Airport on our trip back from the ranch to Buenos Aires, with an onward ticket to Paris, France. In our hands was a bottle of our own wine – the new reserva that we had kept in a barrel for a year before bottling. We had forgotten to put it in our checked luggage. It was in stark contrast to the hysteria rampant these days in North America. For example, pusillanimous Americans are fearful that 10-year-old Girl Scouts or 90-year-old nuns pose a danger to air travel. Jihadi terrorists, Iran, Russia, North Korea, Civil War monuments, kneeling NFL players, gluten, climate change, inequality, the Devil… you name it – all are said to threaten the empire. We made a rushed visit to Argentina. We have two properties there. They almost touch each other, but it takes two hours to drive around the mountain to get from one to the other. One, the ranch we’ve owned for more than 10 years… the other, a farm we just bought. The purpose of the latter is to make sense of the former. On its own, we realized, the ranch can’t work. There is too little water… so the cows are too thin. “It’s not just that,” explained our foreman, Gustavo. “Is there some bull Viagra we could give them?” we wondered. The problem is supposed to be solved by the new farm. There, we will produce thousands of round hay bales – rollos. We’ll truck some of them up to the ranch to feed the bulls and cows. Better fed animals shouldn’t need Viagra. They should produce more calves. The basic economics of a ranch are simple. You produce beef and sell it by the pound. The more pounds you can sell, the more you make. But you have costs – vaccinations, labor, taxes, fuel. On our ranch, the costs are high – because we are so remote. And the cows are thin – because we have so little water. The cows are like a factory’s machines. They produce the calves that we sell. The fertility rate is roughly a measure of the productivity of the operation. Our fertility rate is about the lowest in the whole Cow Kingdom. This year, we will sell about 200 animals – mostly calves. We will have an average weight of about 270 pounds. Each pound will bring us about $1.40. Total revenue: $75,600 (270 x 200 x 1.40). Unfortunately, our costs are about twice as much. We have six cowboys on the payroll, along with trucks, tractors… etc. Obviously, this is not a way to make money. At best, once the new farm is fully functioning, we hope to double our sales and break even. In the world of money and politics, on the other hand, you need a psychiatrist or a lunatic to understand what is going on. It is a world full of hysteria and delusion. Sometimes hysteria just happens; often, people make it happen. Today, central banks, the mainstream media, the feds, and crony Deep State industries have raked the coals and fanned the flames. Over the last 17 years, central banks have pumped about $20 trillion worth of financial Viagra into the system. That’s the amount of additional “assets” (bonds mainly, but also stocks) they’ve acquired with money that never previously existed. All that extra money provided “The Swamp” with the funding it wanted. The “security” industry, headquartered in Northern Virginia, for example, flourished. The numbers are staggering. In fiscal year 2016, the Pentagon issued $304 billion in contract awards to corporations – nearly half of the department’s $600 billion-plus budget for that year. And keep in mind that not all contractors are created equal. According to the Federal Procurement Data System’s top 100 contractors report for 2016, the biggest beneficiaries by a country mile were Lockheed Martin ($36.2 billion), Boeing ($24.3 billion), Raytheon ($12.8 billion), General Dynamics ($12.7 billion), and Northrop Grumman ($10.7 billion). Together, these five firms gobbled up nearly $100 billion of your tax dollars, about one-third of all the Pentagon’s contract awards in 2016. The easy money was available; the cronies took it. But one Goldman Sachs insider expects it to be a $5 trillion market in the next few years. But it’s already minting a new class of millionaires virtually overnight. Pete A. from Richmond, Virginia, collected over $200,000 already… and 60-year-old business owner Mark Richardson earned $200k in only 6 months! It’s all thanks to these tiny $0.01 plays. Hartung reports that, since 2009, the “security” industry spent some $1 billion urging the feds to spend more and more money… often employing as many as 1,000 lobbyists. But the military needed enemies, too, to help justify spending 1,100% more than its most plausible potential adversary – Russia – and infinitely more than its “terrorist” enemies in the Mideast. To paraphrase former Secretary of State Madeleine Albright, if you have all that firepower… you gotta find someone to shoot. And even with all the provocation, funding, and entrapment given to them by the feds, “terrorists” just weren’t getting much traction. After all, in Las Vegas recently, one Anglo-Saxon former U.S. federal government employee bumped off more people in the Christian Homeland than all the Muslim terrorists put together in the last 10 years. Now, Iran is an enemy… even though Iran hasn’t invaded anybody since the Battle of the Eurymedon in 466 B.C. So is North Korea, even though the nation has zero ability to inflict harm on the U.S. And of course, Russia is an enemy too, for reasons that have never been clarified. In our last book – Hormegeddon – we modestly noticed that almost everything is subject to the law of declining marginal utility. A little bit of defense spending may be necessary. But keep adding to it and the results turn sharply negative. You don’t become safer as you buy more weapons and fatten contractors’ bonuses. Instead, you become less safe, as your “security” spending encourages military adventurism and meddling by hysterical men with guns in their hands. The CEO of the largest bank in America, JPMorgan Chase, has been trying to talk investors out of buying bitcoin. As you can see from today’s chart, instead of selling in panic, investors sent bitcoin to a record high. 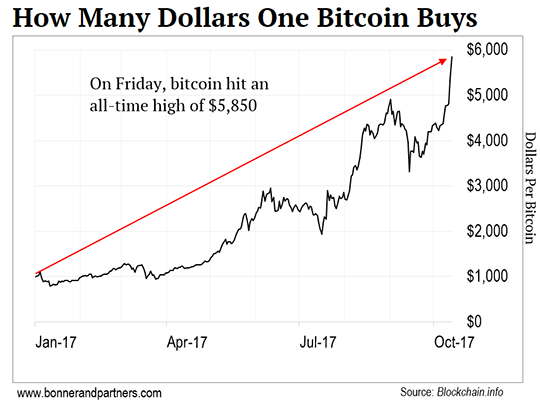 After Dimon’s remarks on Friday, the world’s most valuable cryptocurrency hit an all-time high of $5,850. Bitcoin investors have now made six times their money in 2017 alone. One Silicon Valley startup is undertaking a bold plan: To create a new kind of stock exchange. The new exchange would, ideally, reward long-term investors, but there could be unintended consequences. Recently, a White House memo was leaked to the public. You might not have heard of it, but this memo could have huge implications for one sector. And it could send a handful of stocks soaring. Your ranch looks like it’s in the Valley of the Kings! Good luck on your new ranch! Luckily you are still writing your daily Diary. We would miss these communiques and your sound and humorous advice. Having been raised on a ranch myself, I have frequently wondered if a cattle prod wouldn’t substitute for a defibrillator. Best wishes… and cowboy up, Cowboy! Sounds like you’re in hostile territory, and you’re obviously outnumbered. Get out before it’s too late. I think I’ve met my match in Bill for rebuilding old structures. In 1984, while serving as an Army captain in Wurzburg, Germany, I bought an old 1956 Mercedes 190SL sports car. The local Mercedes dealership offered to restore it for $30K, which seemed like a bargain. About 3 months into the restoration, the chief mechanic called me in to view the progress. We stood in a large open bay where several vehicles were being worked on. I asked him where my vehicle was. He pointed in front of us to what looked like a dilapidated bird cage and said, “If we remove any more metal, it will no longer be a car.” He then asked for $10K more, which I paid. Two years later, they ran out of money, but they finally finished the restoration. P.S. You have my vote as Chairman of the Fed, too. As many of your readers, I thoroughly enjoy the ranch stories. Embarking on a somewhat similar adventure right here in Minnesota, with an 1860-something farmhouse, I see the same potential you see. I think the old adage applies that where some people see problems, others see opportunities. With that in mind, I wonder just how difficult it would be to cut a few trees, haul ’em to the site and build yourself a little bridge to cross that river. From the one picture you sent, it didn’t look all that wide. I mean, the Boy Scouts can make some pretty amazing bridges with sticks and rope. Gotta be a way. Well done on your recent Diary! Having retired from 45+ years of slaving in big corporations, I recently bought a tractor and started a little business of clearing brush and pushing dirt around. Friends and family couldn’t figure out how a guy with an advanced degree and years of experience “managing” new technology could do such a pedestrian thing. Your statement, “put in so much time trying to connect the gauzy dots… we long to grab a hammer and whack something real” summed it up pretty well. I never respond to these things but felt compelled to tell you how ridiculous and insensitive it is to tell us about your tragic loss of your “new ranch house.” Who cares about your numerous houses when thousands of people have lost their only house and have nowhere to live? I wish someone could mention this to you so you know that many, many folks are much worse off. How about mentioning the charity that you are providing to the people less fortunate than you that have lost everything to recent disasters? Sorry to vent, but I just felt I had to tell you how your message came across. Will you ever get this message and take the time to reflect? Thanks for not deleting this message and thinking I am some crazy person, I assure you this is the first time I have ever commented to the numerous email newsletters I read and love! Editor’s Note: Bill reads every piece of reader feedback that comes in even if he can’t respond to every one. Diary readers are always welcome to drop him a note by clicking right here. 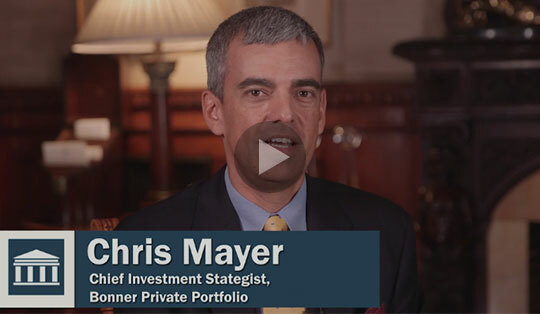 Chris recently told us that he’s been keeping some of his most profitable ideas from readers, and even Bill, for years. But now he’s setting the record straight. See more here.